I spent the last week reading a book about the history of nuclear proliferation around the world. Every two pages (I kept track) had me exclaiming, “You’ve got to be kidding me!” I finished the book last night, and while enjoying my morning joe this morning, I pondered how I could possibly write a review that does this book justice. One of the things we have to remember when we read non-fiction is the topic is being written by one (or two) person’s view. If you are like me, you are extremely interested in the credentials of the author, who the sources are, and what documents they viewed. 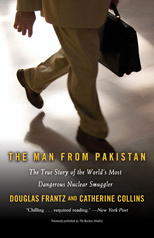 In The Man From Pakistan: A True Story of the World’s Most Dangerous Nuclear Smuggler by Douglas Frantz and Catherine Collins, I didn’t even consider what the authors’ credentials were until AFTER I finished the book last night. Douglas Frantz, the former managing editor of the Los Angeles Times and a two-time Pulitzer Prize finalist, is a senior writer at Condé Nast Portfolio is co-author, with Catherine Collins, of The Nuclear Jihadist: The True Story of the Man Who Sold the World’s Most Dangerous Secrets… and How We Could Have Stopped Him (Twelve, 2007). Catherine Collins, a former Chicago Tribune reporter, is now a Washington-based writer. She is co-author, with Douglas Frantz, of The Nuclear Jihadist: The True Story of the Man Who Sold the World’s Most Dangerous Secrets… and How We Could Have Stopped Him (Twelve, 2007). Interesting note: This book was originally published with the title: The Nuclear Jihadist: The True Story of the Man Who Sold the World’s Most Dangerous Secrets… and How We Could Have Stopped Him (Twelve, 2007). The next thing I wanted to figure out was what were the sources used for this book. Because it was late when I finished the Epilogue, I didn’t read the Acknowledgments or the Chapter Notes. I noticed there was a reference to the website for a list of notes and footnotes. I went there and found some pretty incredible references. The primary source of factual material was hundreds of hours of interviews with people who had firsthand knowledge of the subject matter. In many cases, more than one participant in an event was interviewed; some people were interviewed multiple times over the course of many months. The interviews were augmented with thousands of pages of public and confidential documents from government agencies and courts around the world, personal notes taken by participants, and reports by the International Atomic Energy Agency. As you scroll down, you find links to official transcripts of speeches and articles. Okay, so the authors has some pretty good sources. But what about the conversations and what not? Many of these reconstructions are from official transcripts and post-conversation summaries prepared by participants; in other instances, the information was provided later by one or more participants. Also in the specific chapter notes, you find some examination by the authors about the discrepancies. Let’s get to the topic, now. As stated earlier, the topic of this book is about the history of nuclear proliferation, but its more than that. The book follows the life of A.Q. Khan, a Pakistani who is dubbed ‘the father of the Islamic bomb.’ He stole nuclear secrets and plans from European labs. He implemented a black market network for the buying of equipment needed to to build Pakistan’s nuclear arsenal. He also began a smuggling network to sell technologies to Libya, Iran and North Korea. This book examines how Khan set up his network, and more importantly, how he could have been stopped early on, prior to smuggling secrets all over the world. Important note: He could have been stopped even before Pakistan had a working nuclear arsenal. This one fact is the most frightening aspect of this book. Khan was on the radar for the first time in 1975 – and could have been arrest for stealing nuclear secrets. For the next forty years, decisions were made over and over again to sit back and watch him, gathering evidence, rather than taking him out of play. While a nation’s motives are inevitably complex, the countries pursuing nuclear arsenals in the new age of proliferation faced enemies who might be deterred by the threat of nuclear retaliation: India feared China, Pakistan feared India, and Israel was surrounded by hostile Arab countries. The Iraqi decision was based more on its desire to dominate the Middle East, but its program drove Iran to developing a matching arsenal. North Korea’s nuclear efforts were rooted in decades of fear of the United States; South Africa sought nuclear weapons after international sanctions left it isolated and vulnerable at a time when the Soviets were ramping up their influence in the neighborhood. Stopping the spread of nuclear weapons required tough and enforceable safeguards, but it also demanded that the Americans and other global actors address the issues of security and national prestige driving the new prolifers. These two quotes are on pages 197 and 198. Prior to and after these statements, we see that a great deal of the motivation for developing nuclear arsenals was driven mostly by fear. Countries had sanctions put up on them by the international community causing decreases in the country’s economic ability to survive which in turn causes a fear of being invaded by more powerful nations; other countries were developing their own arsenals which caused the fear of devastation amongst enemy countries. Short-term tactical decisions were being made by the international community rather than long term strategic decisions which appeared to show unfair political advantages towards countries that should have had safeguards enforced to keep them from succeeding in producing a nuclear arsenal causing animosity and more fear due to the alliances made with more powerful countries. The Man from Pakistan is one of the scariest books I’ve ever read in regards to the way the politics in the world actually work. Someone said to me during the elections, “I don’t think the president has any power really at all.” Well, this book takes us down a path of decisions made as far back as Ford, with blatant lies made to Congress, in regards to which countries were participating in the building of nuclear bombs, specifically, in the decisions of whether to keep financial assistance going to these countries or not. The New York Post called this book, “Chilling…required reading.” I tend to agree, everyone should try to read this book, if for no other reason than to begin to understand the driving force for international policy in the world and the United States role in all of this. Please, pick up this book, read it, fight the urge to put it down because its a bit too technical. Its not really. Recognize though, this will be one of the most appalling books you’ve read in a very long time.